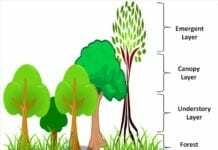 Rainforests are biomes that have a rich flora and fauna. 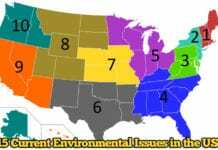 Animal species diversity is highest in the rainforests than anywhere else on earth. Among these animals, there are several types of monkeys live in the rainforest. The greatest number of species of primates found in the rainforest are the monkeys. These arboreal mammals are perfectly adapted to live among the trees typical of the rainforest biome. They have strong, flexible limbs that allow them to climb among branches and swing from branch to branch. These rainforest monkeys occupy several layers of the rainforest. Their hands and feet are also adapted for gripping branches, and they have a prehensile tail. 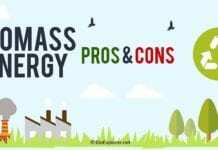 The rich, dense vegetation provides a range of food sources for them to feed on, and provide protection from the predators that hunt them in the forest. 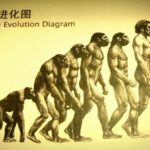 In this article, we will explore 27 different species of monkeys that are found in different rainforest regions of the world. 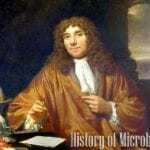 In the animal kingdom, Monkeys are divided into two major groups namely Old World monkeys and New World monkeys. Before we dive into rainforest monkeys, let’s quickly glance the differences between them first. 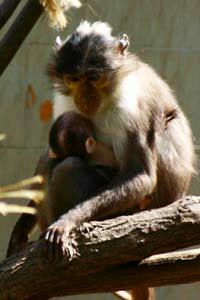 The first type of monkey is the Nepal gray Langur. 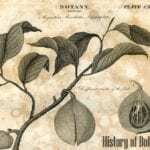 It is found in montane Tibetan forests in the Himalayas and extends into parts of India and Pakistan. 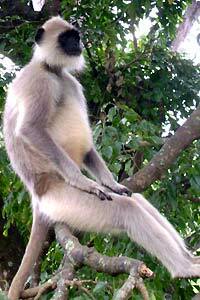 Nepal gray Langur is an endemic species found only in these forests. 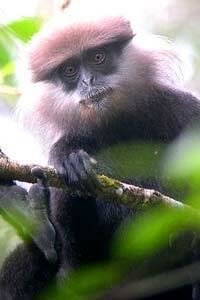 This langur is found from 1500 to 4000 m above the sea level. Nepal gray Langur is herbivorous, feeding on leaves. Purple-faced Langur is a species of monkey that is endemic to Sri Lankan lowland tropical rainforests. 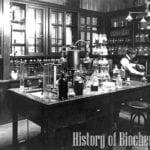 It is much endangered today due to great forest destruction. This langur has a purple-black face. 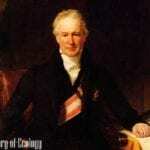 They also have white sideburns on the face. The purple-faced langur is mostly folivorous , but will also feed on fruits, flowers, and seeds. Purple-faced langur is by nature a very shy animal. Samango monkey is one of the largest monkey species. 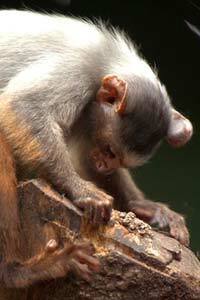 They live in evergreen montane tropical forests of Africa, including the Ingeli forest of KwaZulu-Natal. Anatomically, Samango monkey can grow up to 1. 2 to 1. 7m long. Samango monkeys tend to live in groups typically up to 30 individuals. This species of monkey is one of the very vocal and loud. 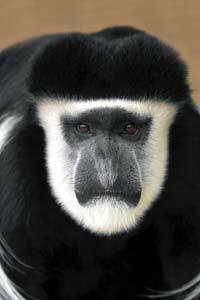 Black Colobus monkey is found living in the Lower Guinean forest region where their population has suffered from the destruction of their forest habitat. 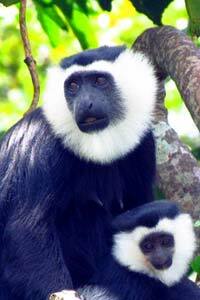 Black Colobus is one of the smallest monkeys, and their body size is about 50 – 70 cm long. Black Colobus monkeys live in the canopy layer of the rainforest. The Black Colobus are mainly seed eaters. 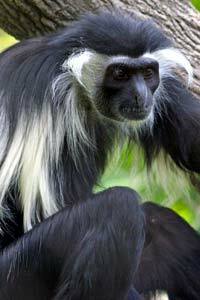 A resident of Congolese rainforest region of Africa, Angolan Colobus monkeys are black with long white silk-like hair. 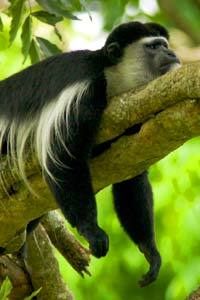 Angolan Colobus monkeys are diurnal animals, active during the day. Angolan Colobus is arboreal in its activity. 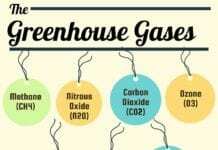 Their main type of food is leaves. 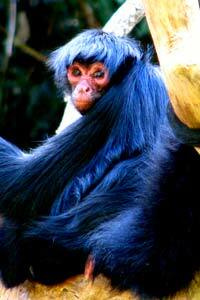 The next type of monkey that reside in rainforest, King Colobus, found in both the Upper and Lower Guinean forest. They live in small groups of females and males. This monkey grows up to 67 cm in size. This is a species found in the trees, that is it is arboreal. It is primarily a leaf eater. 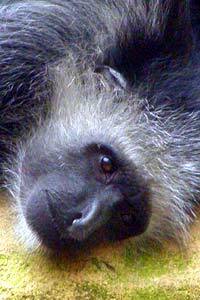 The next Old world monkey in our list is Ursine Colobus. This species of monkey lives in both the Upper and Lower Guinean forest of Africa. Ursine Colobus monkey weighs about 8 to 10 kg. 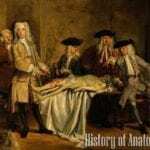 The body has a very slender form. Ursine Colobus is one of the polygynous monkey species. Mantled Guereza can be found in rainforests across central Africa from Lower Guinean Forest and into the northern parts of the Congolese forest. Mantled Guereza monkey is active during the day. 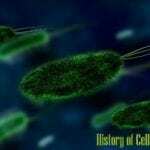 They live in social groups of up to 15 individuals. This Colobus is also a polygynous species. 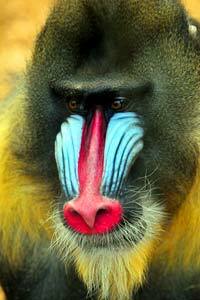 Mandrill is a very large monkey, and it has bright coloring, especially on its face. They form large troops that move across the forest floor. They live in the Lower Guinean forest region. The Mandrill males can reach sizes of from 25 to 50 kg. The rump of males becomes brightly colored when they are mature. Mandrill monkeys live in West African countries. Sooty Mangabey monkey is named for the color of its coat. It is usually found moving about in the low levels of the forest and in the understory. It lives in the Upper Guinean forest of Africa. Sooty Mangabey is a host of the SIV virus which is closely related to the HIV found in humans. Sooty Mangabey monkeys are active during the day. 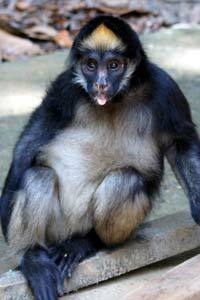 The Mangabey is commonly found in north-west Africa extending from Ghana to Senegal. 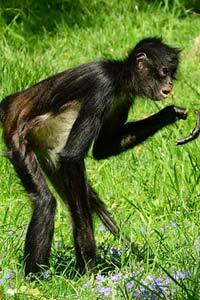 White-Bellied Spider Monkey has a white belly and long spider-like arms and legs. They are found in the Amazon rainforest, but they are endangered due to habitat loss. White-Bellied Spider monkey lives in troops. White-Bellied Spider monkey plays a very important role – seed disperser. They tend to prefer to feed on mature fruits only. The next rainforest monkey is Peruvian Spider Monkey, which has a black face and can be found in the Amazon rainforest in Brazil and extending into Bolivia. Peruvian Spider Monkey reaches a size ranging from 40 to 52 cm in length. Compared to other rainforest monkeys, Peruvian Spider monkeys have a very long flexible tail. Peruvian Spider Monkey can be recognized by the tip of the tail which is hairless. 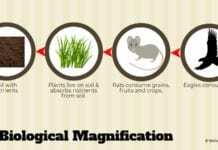 Geoffroy’s Spider Monkey needs large expanses of forest to survive. It is found in the rainforest of Guanacaste province of Costa Rica, extending upwards into the Bangia Minga rainforest of Central America. Geoffroy’s Spider Monkey can weigh up to 9 kg. 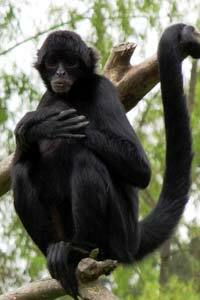 Size of Geoffroy’s Spider Monkey varies from 30 to 63 cm long. Due to habitat destruction, this species is now considered endangered by the IUCN. This next rainforest monkey (Brown Spider Monkey) is critically endangered and is found in the canopy of the Amazon rainforest in Columbia. 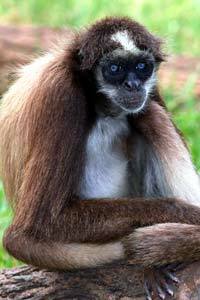 Brown Spider Monkeys have a long tail, up to 75 cm in length. They have unusual blue eyes which is very uncommon in other primates. Brown Spider Monkey can weigh between 7.5 to 9 kg. White-Cheeked Spider Monkey species is endemic to the Brazilian Amazon rainforest, where it is an endangered species. 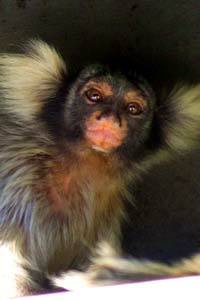 White-cheeked Spider Monkey usually lives in groups of 2 to 4 individuals only. Like White-Bellied Spider Monkey, White-cheeked monkeys are also play a vital role in seed dispersal in the rainforest. White-cheecked spider monkey reaches its sexual maturity at the age of 5. Black-headed Spider Monkey lives in the Amazon rainforest, where it requires a large area and is thus critically endangered today due to habitat loss. 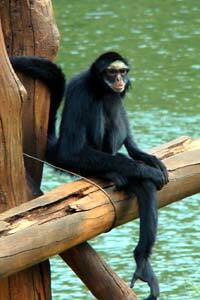 The body size of this Black-headed Spider Monkey varies from between 39 to 54 cm. In this species of monkey, females sometimes mate with several males. Black-headed Spider Monkey only reproduces every three years. 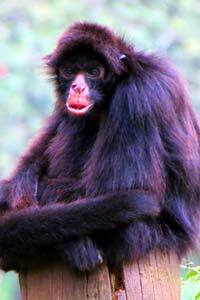 Our next rainforest monkey is Red-faced Spider Monkey which lives in the northern reaches of the Amazon rainforest. It is not yet endangered but classified as vulnerable by the IUCN. This spider monkey has a body size that is up to 56 cm long. At night they sleep in groups in the trees for protection. It lives in the upper canopy of the rainforest. 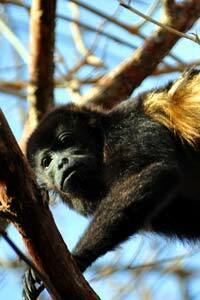 Mantled Howlers are mainly found in rainforests of Central America and northwestern South America. The Mantled Howler is one of the largest new world monkeys. Mantled Howler can weigh as much as 9.8 kg. This species of monkey is highly vocal, often heard to “howl,” hence the name “Howler“. Silvery Marmoset is one of the smallest monkeys in the new world monkeys. They reside in the Amazon rainforest of Brazil. This little monkey reaches a size of up to only 28 cm long. Silvery Marmoset weight is up to mere 400 g only. Silvery Marmosets are omnivorous feeding on a range of foods from vegetation to small animals. Santarem Marmoset is the next rainforest monkeys and they are found in a very small region of the Brazilian Amazon rainforest. 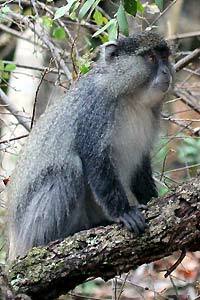 The tail of Santarem Marmoset has a unique black and grey rings. 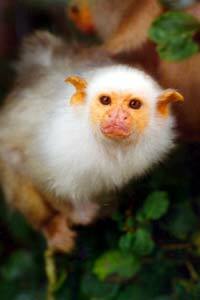 This Santarem Marmoset has light grey shoulders. Santarem Marmoset ranges in size from about 20 to 27 cm in length. It tends to prefer the lowland forest of Brazil. 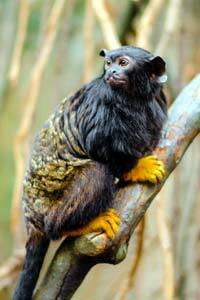 Rondon’s marmoset is primarily found in the south-west part of the Amazon rainforest. Rondon’s Marmoset has a distinctive silver coat. They can reach a size of 22 cm long, and weigh about only 300g. Interestingly, Rondon’s Marmosets feed on exudates from trees, such as tree sap for instance. Roosmalens’ Dwarf Marmoset is a very small rainforest monkey and it is found in a small region of the Amazon forest. Roosmalens’ Dwarf Marmoset body length can vary, and they can reach up to 39 cm in size. 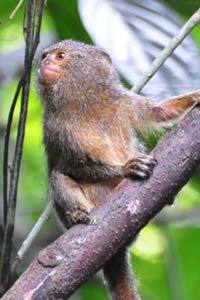 Roosmalens’ Dwarf Marmosets have claws that enable them to grip the tree trunks easily. Like Rondon’s Marmosets, this species of monkey also feeds on sap from trees. This little Pygmy Marmoset is found in the western Amazon rainforest of South America. Pygmy Marmosets communicate using both chemical and visual signals. Pygmy Marmosets are tiny monkeys reaching only up to 15.2 cm in size. They are a strictly arboreal species. Red-handed Tamarin monkeys are found in much of the Amazon river basin. It is a fast, agile jumper moving between the trees. Red-handed Tamarin monkeys grow up to 28 cm in size. This tamarin can jump great distances of over whopping 18 m from tree to tree. Red-handed Tamarins are omnivores feeding on a wide range of food items. 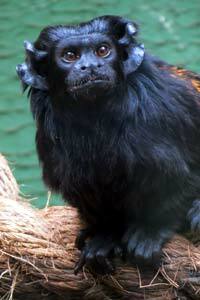 This black tamarin monkey resides in the Brazilian Amazon rainforest. Black Tamarin is endemic to the Brazilian rainforest. 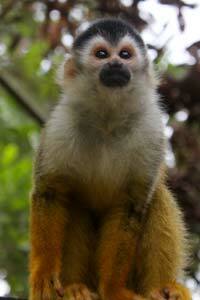 Their weight is about only 500 g.
This monkey occupies the lower to middle strata of rainforest trees. 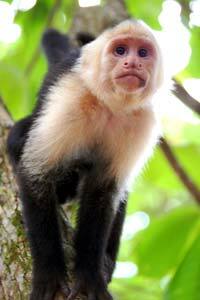 White-headed Capuchin monkey can be found in the Amazon rainforest and Central American rainforests. White-headed Capuchin can live in a large troops of up to 40 individuals. White-headed Capuchins are arboreal, living and feeding in the trees. White-headed Capuchin monkey is diurnal. Our last but not the least rainforest monkey is Central American Squirrel Monkey which is found in the rainforest of Monte Verde Costa Rica and extending to Panama in Central America. Central American Squirrel Monkey has a distinctively colored orange back. Their body length is about 290 cm. Central American Squirrel Monkeys are very sexually dimorphic. Having seen so many monkey species, now it is your turn. Have you ever seen any rainforest monkeys? 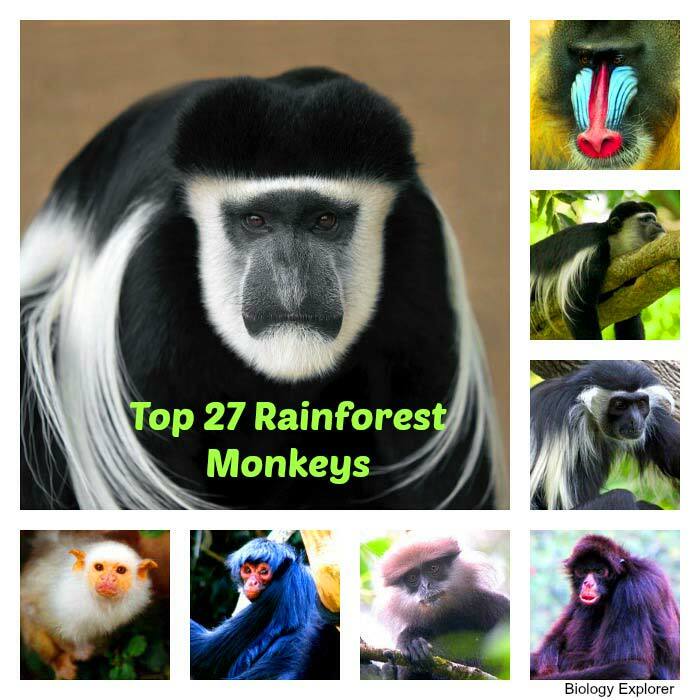 Cite this article as: "Top 27 Types of Monkeys Live In Rainforest," in Bio Explorer by Jack Kirsten, January 2, 2018, https://www.bioexplorer.net/rainforest-monkeys.html/. 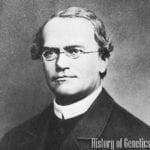 Myers, P. Primates: Animal Diversity Web. 2000. http://animaldiversity.org/accounts/Primates/ (accessed 12 7, 2017). Stuart, Chris Stuart, and Tilde. Field guide to the mammals of Southern Africa. Cape Town: Struik, 1990. The University of Wisconsin. Primate Info Net. 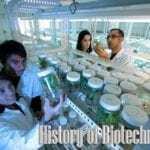 2013. http://pin.primate.wisc.edu/aboutp/ (accessed December 7, 2017). Wildlife, All About. Old World Monkeys. 2017. http://www.allaboutwildlife.com/rainforest-monkeys-of-africa-and-asia (accessed December 7, 2017).